So yes people. Facebook is changing. I know many are freaked out but as a social media junkie – I am super stoked. As a mom of digital kids – I am even more stoked. Why? Because of the Facebook Timeline feature that Facebook introduced at F8. Facebook will create a timeline of the events, photos, videos, etc that you upload to your profile. As the years go on, you’ll see a timeline to a digital time capsule per se of your life. 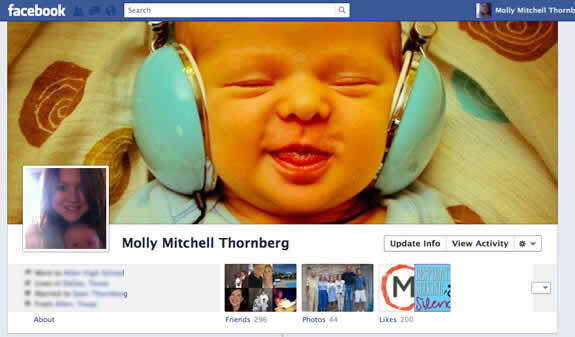 Are you excited about the Facebook Timeline yet? Currently Facebook is open to kids 13 and up. Whlie I know many of my kids’ friends are on there, by lying about their age – due to COPPA laws – 13 is the earliest age a member should be. Well the crazy thing is, that scenario may never happen for my kids. As their friends move away, with the digital age they will be able to remain connected. And with cool features online such as Facebook’s new Timeline feature, someone’s life will be there for you to see. Yes, of course privacy is a concern. With Google + nipping at the heals of Facebook with their cool new, easy to use circles – Facebook knows they must get their act together with privacy. Facebook Timeline officially launches on October 3. But thanks to Tech Crunch you can activate your Facebook timeline now. GIve it a whirl. I still have some tweaking to do, but overall – it’s oh so pretty. What Are Your Thoughts on Facebook Timeline?